Step #7. Put your latex gloves on and place your safety mask onto your face, to prevent inhalation of paint fumes during the spray painting process. Leaving the drawer intact, place your end table on the center of the tarp. 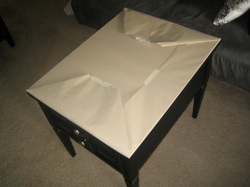 Stand at least 2-3 feet from the end table and begin spraying it with a graceful left to right/ right to left arm movement. 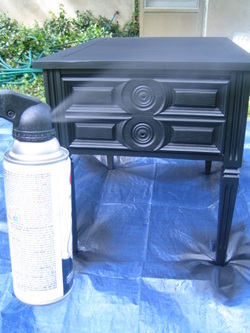 This allows for an even spray with little to no dripping on the end table. Continue this spraying technique from beginning to the end of the spray painting process. 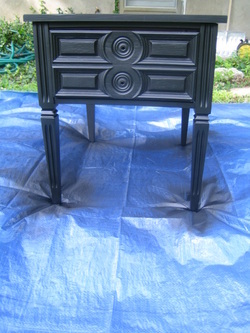 After the initial coat, allow some time from drying and spray an additional coat or more ( as your prefer). 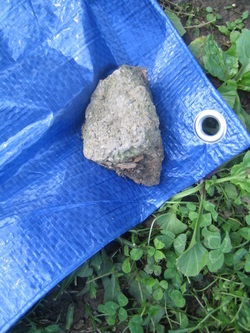 Step #8. 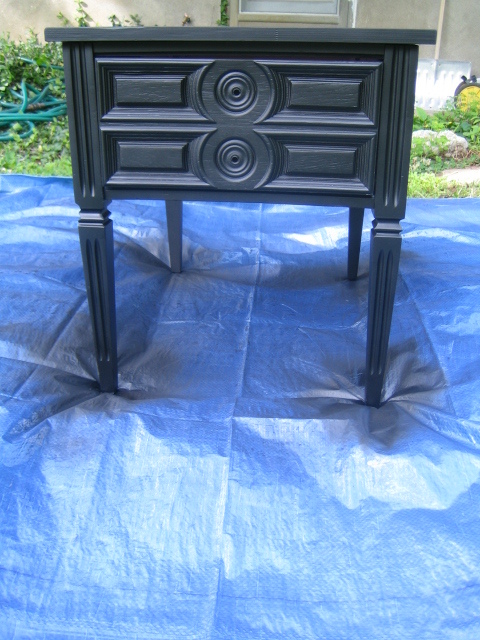 Once your done spray painting your end table, allow it to dry and cure. I suggest at least a 24 hour period for this process. Step #9. 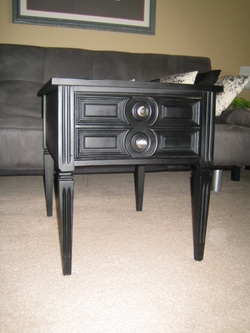 Once the paint has finally dried, take your furniture polish and towel to wipe the painted areas of the end table. 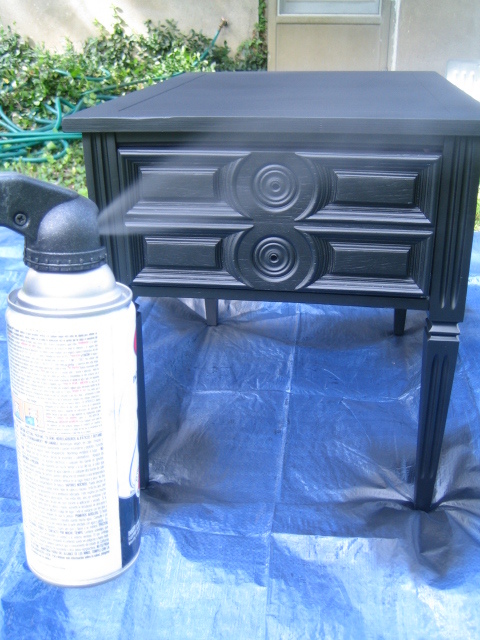 Doing this especially if you've painted it with a "flat" spray paint, will clean off the top coat color residue left over from the spraying process. When your finished wiping down the end table, you should be able to go over it with your index finger and have no paint color residue on it. Now the major labor portion is complete!! Step #10. 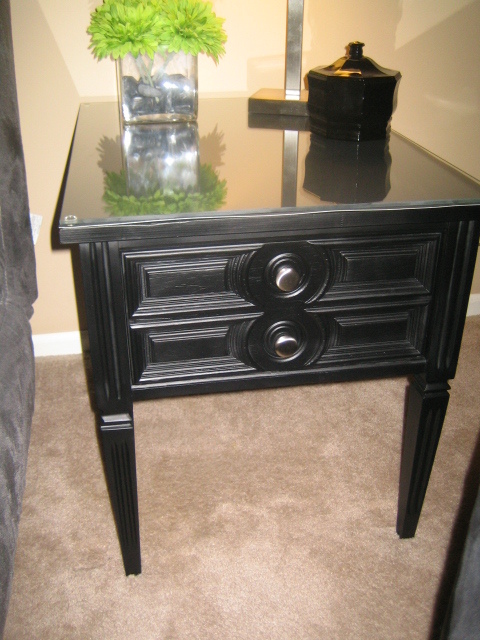 Now take the electrical tape off the inside of the drawers knob holes, and attach your new knob hardware. Step #11. I always like the aesthetic look of a glass top on my DIY tables. 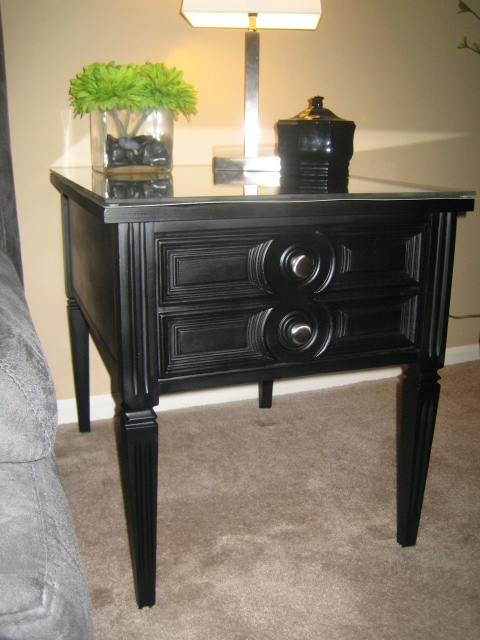 If you opt to top your end table with glass, be sure to take length x width measurements and contract a local glass cutter and give them those extact dimensions. 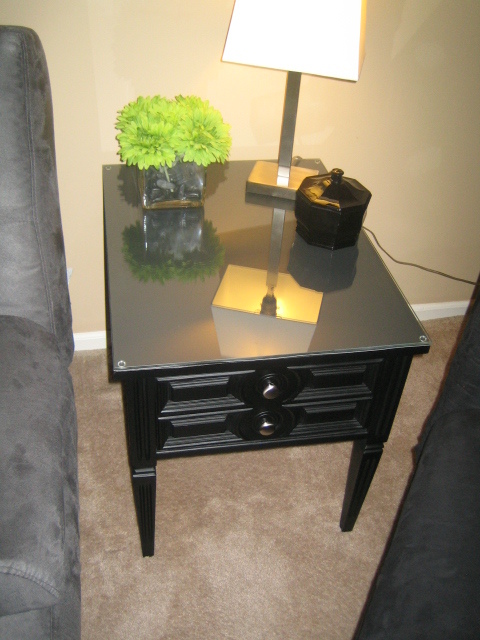 Once you finally get your custom glass top, lay it on top of your end table to make for sure it's an exact fit. Step #12. Unwrap your custom glass and clean it with window/glass cleaner on the front and back sides of the glass. Step #13. Place your custom glass on top of your end table and now it's ready to add an interestingly new element of decor to your living room or bedroom.